This make me smile too. It's amazing. Who could not smile after seeing this? Greetings from the center of Argentina. Hey Simone, is there any possibility of meet all of you in the sound testing or something before the show in Buenos Aires? It would be great! Of course we will see you on the Teatro any way :) so see you later! Can't wait to see Epica in Milan next year! Really is a good painting. Wow, that's a beautiful painting. Thanks for sharing it with us! Hope you enjoy the capital of my beautiful country! And if you have time, I highly reccommend the Iguazu Waterfalls! (Cataratas del Iguazú) they're AMAZING and one of the 7 natural wonders of the world! Hope you guys have a wonderful time in there. are you in buenos iares??? i'm form buenos aires??? what??? oh my god!!!... why are you in buenos aires simone!!!!!!! ??????? oooh... with kamelot... i remember.... i'm sorry... buuuuu.... come back soon... kisses!!!! Its awesome, its like the people here i Perú, please you have to be here soon, SO AMAZING !!! Wow this is amazing. I'm on a epic quest to read every one of your tweets as far back as twitter history will let me (12 Dec 2010), it involves seeing a lot of old links you posted. I don't remember seeing this post before. 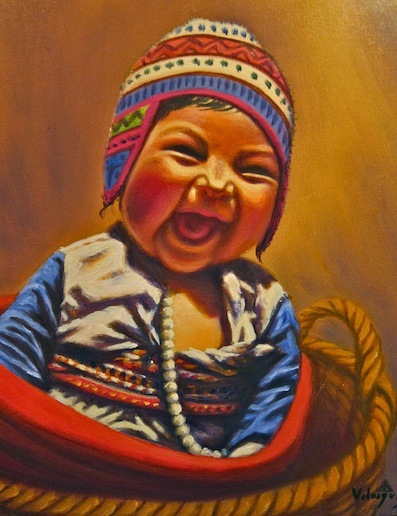 I agree, I can "hear this baby smiling"
Stared at this for a good 10 minutes. You're very lucky to travel the world & see amazing things like this.